For a moment the Serpent and I were poised on Asgard’s parapet. I knew it was a dream, and yet it felt so pure, so powerful – surely beyond the power of any single human to build. And I was corporeal: I could smell the ocean, the ozone in the atmosphere, the flowers from Idun’s garden. I inspected my current Aspect. Not quite my own, but close enough – though the headgear was unfamiliar. But I was, if not myself, then at least as close as any dream could get. Who was responsible for this? Who could have dreamed this place into being? Once more, I looked at that glow in the sky. Tangled with runelight, it beckoned and shone like a luminous, living thing. Could one of the other gods have survived? Had Gullveig-Heid escaped Ragnarók? Could this even be a new god, bringing a new World out of Dream? We were in a computer game. THE GOSPEL OF LOKI ended at Ragnarok, the End of the Worlds, with Asgard fallen, the gods defeated and most of them either dead, or consigned to eternal torment in Netherworld. However, Loki manages to escape into another World through Dream, and finds himself, to his surprise, incarnate in a human host – a 17-year-old girl called Jumps, and living in our own World. But, as he starts to come to terms with the challenges of being in a human host – including school exams, eating disorders, inexplicable feelings of worthlessness, a tendency towards self-harm and the uncertainties of emerging teenage sexuality – Loki realizes that there may be a way to escape the chains of mortality and return to the World of the gods. THE TESTAMENT OF LOKI can be read alone, or as part of a sequence of RUNE books, which include (though not necessarily in that order) RUNEMARKS, RUNELIGHT and THE GOSPEL OF LOKI. Q: In what order should I read your RUNE books? Q: Tell me more about Jumps. A; She’s one of my favourite characters in this series: rebellious, sulky, insecure and troubled. She’s struggling with an eating disorder and a self-harming habit; she has controlling parents to whom she can’t admit she’s gay, and her only real friend is a manipulative young man called Evan who has repeatedly let her down. And yet she turns out to be stronger and tougher than Loki anticipates – and in spite of himself I think he’d agree that he learns a lot from her. Q: Why did you decide to set this story in our world, in the present day? Q: Will we meet any more of the gods in this book? J.D. Dehart, on Goodreads: In Harris’s hands, the story places mythological characters into a new setting, taking on the shape of new characters with an effect that is full of delight and insatiably readable. 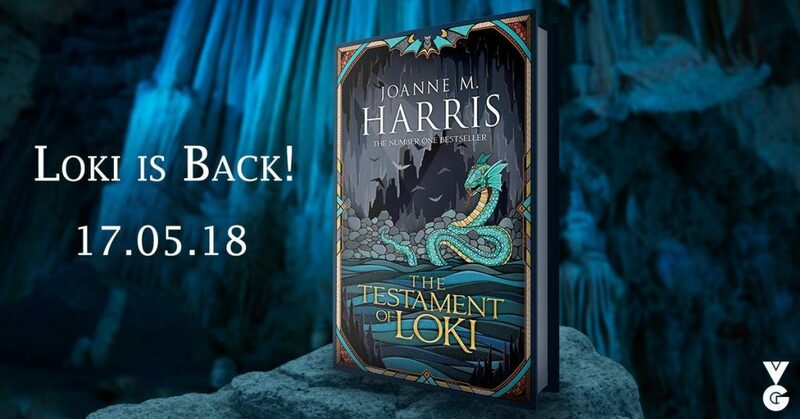 It’s the kind of book that makes me want more and, though I do not want to chain an author of Harris’s talent into an endless mythology series, I would gladly pick up a next entry in the series, or a similar title that takes a new direction. Impressive, entertaining, charming, and literary, I recommend The Testament of Loki without reservation. Amazon: A fitting new chapter in the adventures of our exiled Asgardians as there is a battle for power between opposing forces based around desire and lust for power. Captivating and going to bring both a smile to your face as well as make you remember what it was like to be young again. I think this is a book you need to read – ideally, with pizza.